As a photographer, it matters because you may be asking yourself, “with all these cameras around, will there still be a need for me?”. 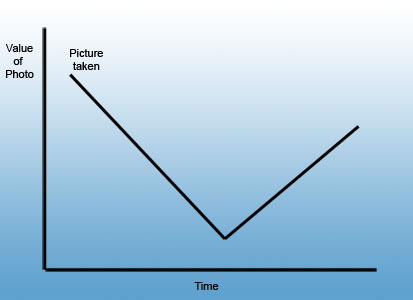 So it’s important to understand why people are taking pictures and what they’re doing with them. Not only from the perspective of will you have a job, but are there products or services that you can sell to them that will incorporate their photos as well as the images you take of them. The other reason it matters, is the industry as a whole (especially companies that make printers) is asking whether consumers will still want prints. Now that you can email photos around and view them on beautiful high resolution screens, why would you ever want to print? I don’t think prints are going anywhere. People still live in boxes (houses, cubicles, etc) and they want to hang stuff on the walls of those boxes. Electronic photoframes are nifty, but what parents house would be complete without a Wall of Shame featuring their progeny? I find it unlikely that you’ll see tons of photoframes up on the wall displaying slideshows, if only because you would have to have 50 power outlets. Consumers ARE printing less, taken as a percentage of the number of pictures they take. However, because they’re taking so many more pictures, the absolute number of prints being made is staying about the same. This makes sense. You no longer have to print out an entire roll of pictures to get the one or two you really want. Many of the cameras out there, especially camera phones, don’t take great pictures. They’re fine for posting on Facebook to let folks know what you did last Friday, but they aren’t exactly keepsake quality. And speaking about Keepsakes… what about professional photographers? Again, I don’t think there’s anything to worry about. Photography is a skill and getting consistently good shots will continue to be valued. But the value of the experience of going to a pro photographer will go up. If someone is going to go to the trouble of getting a professional portrait, they’re going to expect it to be an experience worth remembering in and of itself. Many photographers already understand this, so its hardly news. But I’m guessing it’ll become even more important. This may involve stuff like shooting video from the moment they walk in and giving them a DVD of the photo shoot process, a sort of ‘behind the scenes’ documentary. This becomes another selling point or thing to be sold. Creating a photo book of all the behind the scenes images, for example. And in terms of what consumers want, photo books are way up there. It’s one of those things that can be difficult for them to create themselves, especially when you’re talking about high quality photo books. It’s really what people are looking for and there are tons of options out there. So as a photographer, you’re not just selling a print, you’re selling a multimedia experience that culminates in a great 16×20 photo, photo books, and even a DVD. We’ll talk about cameras and other technology in part II. I was looking for some insights about the future of photography as digital has become dominant and I found your informative article. I agree that professional photographers are still in demand, but the expectations from their potential clients is increasing.